You can earn 15 PawPoints on this product! Salmon oil is a great supplement for all dogs and cats but not all oils are the same! Most companies tend to buy in their oil which has been heat extracted and separated by a centrifuge – which can ‘damage’ the product, but NOT CSJ! We have finally sourced what we believe to be the best quality salmon oil in the world supplied by the only company to use freshly caught Norwegian salmon which they process by cold pressing within 24 hours in their factory – to produce the purest salmon oil possible. 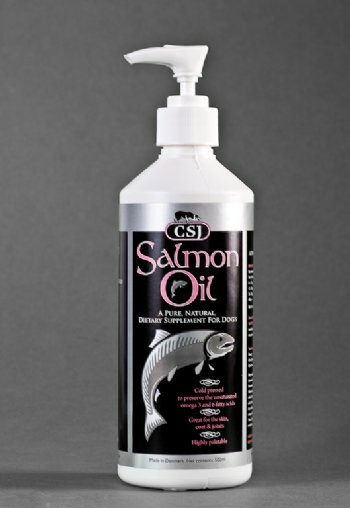 CSJ Salmon Oil contains no preservatives or artificial colours – it is 100% pure and by cold pressing the salmon, the important unsaturated fatty acids Omega -3 and -6 are not broken down and their qualities impaired. These essential fatty acids are important to your dog/cat as they will help strengthen the immune system and help maintain healthy skin and a glossy coat. Both Omega –6 and Omega –3 fatty acids belong to a group of polyunsaturated fats called ‘essential’ because they are necessary to life and to health. Yet animals and humans cannot produce them in the body – they must be obtained from the diet. They cannot be inter–converted and both must be present in a proper balance for good health. Their differences lie in their chemical structure and their roles in the body. Basically, the Omega –3s have anti inflammatory benefits and help prevent heart disease, whereas Omega-6s lower blood cholesterol and maintain a healthy coat and skin. Omega –3 are the essential fatty acids known as the "super-unsaturates”. They are a family of essential nutrients which when present in the diet over a long period of time, may have the power thousands times the power of Aspirin to stop the inflammatory reactions responsible for arthritis and hip displasia. Omega -3 are concentrated throughout the food chain, but are most abundant in the oils of cold-water fish such as salmon. (Source: USDA Nutrition Database Grams per 100gm portion). 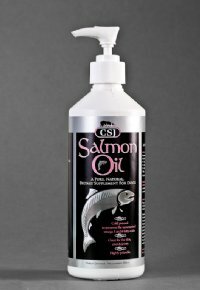 Mix the salmon oil into your dog/cat’s dinner. ** It will also act as an ideal ‘carrier’ for our CSJ working herbs. Review: I bought this for my sprocker and everyone comments on what a lovely, shiny and soft coat she has got. She loves it on her breakfast and I think it has helped with her eating habbits, as before i got this she was a fussy eater. "Shiny coats no more itching." Review: This supplement really helps my dog with itchy skin. She is a black lab and when I got her she was in such poor condition she looked brown and was full of flaky skin. She is now glossy black with no more itching. She is on fit and fast too. "Not only does you good but feels good too!" Review: Obviously not putting hands in the oil!, but my goodness 2 Husky x Timber Wolves at 8.5 months and their coats so thick and shiny and just gorgeous to the touch. Knowing it's doing them good as well and they love the taste. Review: Having supplemented Hendrix's food (fit n fast) for the last three weeks I can honestly say that he's coat is the best condition it has ever been in causing more than one person to stop me and say how beautiful it looks, barely believing his age (9). Also I cannot find a better price for the quality of product anywhere. Review: I have been adding this to my dogs food for the last 4 weeks. This product has been amazing for him. I have been giving it to him to help Supplement post TPLO. I feel this product is really helping him with not only his recovery but also finding him an amazing glossy coat.